Justice Ministry investigates allegations police severely beat an American citizen taking part in violent riots in Jerusalem. Israeli authorities have opened an investigation into an incident in which police are alleged to have beaten a US citizen who took part in Friday's riots in Jerusalem. Tareq Khder is a cousin of murdered Arab teenager Mohammed al-Khder, whose death sparked days of riots after as-yet unconfirmed rumors he was killed by Jewish extremists in "revenge" for the murder of three Israeli teens. 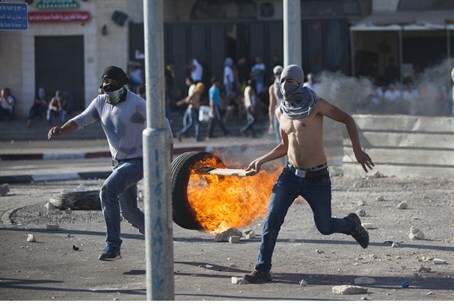 The alleged incident took place in the Arab neighborhood of Shuafat in Jerusalem Friday, after the slain teen's funeral and on the third day of riots, which are still ongoing as of Sunday morning. A grainy video circulating on social media appears to show police beating a youth in the neighborhood, before dragging him away into custody. According to a Justice Ministry spokesperson, an investigation was opened on Saturday night into the incident by the Justice Ministry Police Internal Investigations Department. Speaking to AFP on Saturday, police spokeswoman Luba Samri could not confirm it was Tariq in the video, but said the footage was from the arrest of a group of six Arab rioters, of whom Tariq was one. Samri said police found a sling on Tariq, who attacked police and resisted arrest, while others were stoning police officers and throwing Molotov cocktails at them. Samri said six police were wounded during that arrest operation. Abu Khder is to appear before a Jerusalem court on Sunday, according to his parents. The US State Department reacted swiftly to the allegations, saying it was "profoundly concerned" over the reports. State Department spokeswoman Jen Psaki said the United States "strongly condemn(s) any excessive use of force," in the wake of Tariq Khder's case.